This week, our leaders in state government heard just how important state parks are to our state’s environment, economy, and communities. Since Monday, over 700 letters have been sent to Gov. Bentley, Lt. Gov. Ivey, and the legislators who represent you in the state house. The message you sent has been loud and clear: we want our state parks open and accessible. Gov. 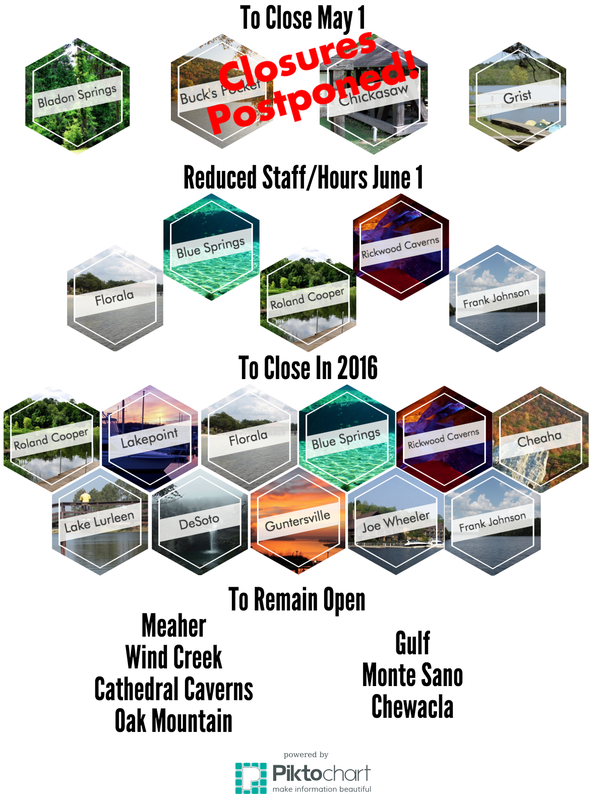 Bentley has indefinitely postponed the closures of four Alabama State Parks that were scheduled to shut down on May 1. Bladon Springs, Buck’s Pocket, Chickasaw, and Paul Grist State Parks will now remain open and staffed for the time being. Unfortunately, our state’s budget problems are not over. The cuts that would shut down 15 of our 22 state parks in 2016 are still being considered by the legislature as they continue to draft a budget. If you haven’t already, please let your elected officials know that Alabama’s state parks are not bargaining chips. Together, we can protect our state parks!